Home » SEO Articles » Is it important for SEO to rank first in 2018? 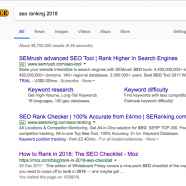 Is it important for SEO to rank first in 2018? When starting with SEO one of the top goals for businesses is to rank first on the search results. It is the equivalent of success and lots of SEO professionals have been working hard to deliver a good ranking to their clients. As SEO is changing though, is it still relevant to aim for a #1 ranking on SERPs? And if it’s not a priority anymore, what should you do instead? Every company would like to show up as the first result in a search engine. And it’s not just for the sake of vanity, as the top ranking increases your chances of improved awareness, traffic, authority. There are more than 40,000 search queries processed by Google every second, which means that there are more than 3.5 billion searches every single day. We were reporting back in 2013 how the top listing in Google’s top position receives 33% of the total traffic. The second position received 17.6% of the traffic, while the fifth result only received 6.1% of the traffic. This meant that back in the day, the initial goal was to show up on the first page of SERPs and then to work harder to reach the top. It’s not always easy to achieve it and the authority of your site certainly plays a big role, but it was still considered the ultimate goal. SEO has evolved quite a lot since 2013, which means that even the definition of a successful SEO strategy has changed. It’s not enough anymore to aim for a top ranking. At least, not in the organic search results. The big difference with SEO ranking through the years is that search engines are becoming smarter. Users are happier with the ease of finding what they’re looking for and businesses have to adapt in the way SEO works. There may still be companies that aim for the top ranking in SERPs, but is this still the definition of SEO success? If we want to combine success with ROI, then is it enough to rank first? There are growing discussions on the organic drop of CTRs even on popular terms. This is due to the changing nature of SEO and how users search for a result. You’ve probably noticed on your own that search has evolved and you won’t necessarily reach the first organic search result to find the answer you’re looking for. Google’s focus on adding additional boxes and ads at the top of the SERPs reduced the chances for people to notice the organic results. It’s not a distraction per se, but rather a new way of finding the answer to your questions. This is a good change for the user, so all you need as a company is to adjust to this change when planning your SEO strategy. Thus, you don’t necessarily need to aim for a top ranking, but you can still optimize your content to increase your success. SEO becomes more sophisticated year-by-year and this means that your goals are also evolving. It’s not enough anymore as an SEO professional to promise top ranking. There is already a change in perception of what counts as SEO success. It’s definitely important to rank as high as possible in SERPs, but you don’t need to aim for the top position to see an increase in clicks and engagement. Find the best way to improve your ranking step-by-step by paying close attention to Google’s updates. This is a good old tip but it’s still applicable to a modern SEO strategy. Do not ignore optimization of your copy either on your site or how it shows up in search results. Spend the right time to build a result that is relevant, appealing, and engaging. Search ranking is becoming more competitive, which means that it’s harder to rank on top of search results. This doesn’t mean that you can’t find SEO success though. You can go beyond organic search results to succeed, whether it’s with ads or an additional optimization to land first on featured snippets and answer boxes. Here’s everything you need to know about featured snippets and how to make the most of them. Focus on your clickthrough rates. Your CTR affects ranking and there is a confirmation coming from Google’s engineer Paul Haahr. He mentioned in a presentation that a high CTR can affect your ranking as it gives the signal that your page grabs the users’ attention. Rankbrain can actually affect ranking to results that show up higher than they should have been, with the number of CTRs determining the permanent position. Thus, make sure your page is appealing, optimize the headline, the description and the content to bring an increased number of visitors to your content. As you manage to bring in new visitors to your site, you want to ensure that they’re enjoying your content. Content is still a very important ranking factor for Google and it’s always a good idea to focus on the quality of your copy. Find the best way to add value and make sure that your content is relevant for your target audience. Keyword optimization can still be useful but it’s the quality of your copy that will determine your ranking. Link building is still important, which reminds us that some basic SEO strategies are still prevalent even in an updated way. Once your new visitors land to your page and enjoy your copy, the next step is to keep them coming. You don’t want to increase your one-time visitors, but you’d rather have them visit your page on a regular basis. Thus, you want to convince them to proceed to further actions, whether it’s clicking on a CTA button, subscribing to your newsletter, requesting a demo, or even visiting multiple pages. The time they spend on your site helps search engines understand if your content is relevant for them. In fact, the RankBrain update placed ‘dwell time’, the time a user spends on your site, as a very important ranking factor. It’s not enough anymore to bring in new visitors if they are not interested in learning more about your content and your site. A good way to increase engagement is to focus on user intent and how people use search engines. Think like a user, not a business and create an optimized copy that will be both enticing and useful. Should we stop aiming at ranking first? You can still involve the top ranking as part of your goals, but it’s good to understand how SEO is changing. It could be a welcome addition to reach the top of the SERPs for your favorite keywords, but it’s even better to bring the ROI that will justify your efforts. SEO is going beyond vanity metrics and it is focusing on delivering the best user experience. The more you spend time on understanding your users, the higher the chances of a successful SEO strategy.